Like master artisans selecting the finest raw materials for their showpiece designs, New Caledonian crows identify the best plants for fashioning hunting hooks from among myriad shrubs in the forest undergrowth, researchers said Wednesday. The notoriously bright birds—one of the few animals apart from humans known to manufacture their own tools—use leaves and plant stems to create an array of utensils they then wield to forage for bugs in the ground or prise prey out of deadwood. "If you imagine these birds live in dry forest, so there's a lot of paperbark trees, different shrubs and bushes," said Barbara Klump, research fellow at the Centre for Biological Diversity, University of St Andrews in Scotland, told AFP. "The question is how do they recognise the right material? There are so many options in the forest and they clearly have a specific idea of what they want." Klump and the team from St Andrews carried out a string of tests on the crows, using types of plant with near-identical leaves native to the Pacific archipelago. Previous studies showed that the crafty crows prefer a particular species of flowering plant, which has a robust but malleable stem that they fashion into hooks. In Klump's study, published in the journal Royal Society Biology Letters, crows were shown their prefered plant next to a similar-looking one in the lab. Perhaps unsurprisingly, the crows knew the difference and frequently opted to approach their preferred material. In a subsequent test the leaves were removed from both plants and replaced with those of a third plant. But the crows weren't fooled, once again plumping for their favourite shrub. "The general idea we had is that they would look for the leaves because they are more conspicuous and maybe then they would look at the stems as a second step," said Klump. "They did recognise the leaves, but this really showed us that the stem is the main thing they focus on. They are very picky." 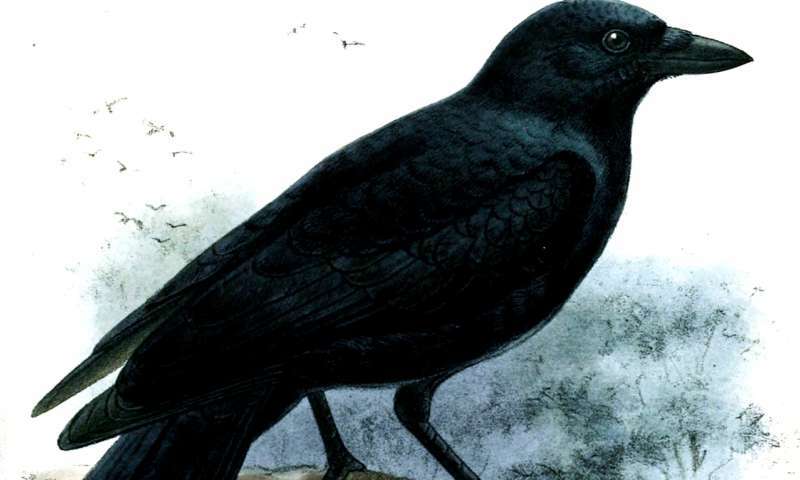 The crows of New Caledonia—a French territory around 1,500 kilometres (900 miles) east of Australia—have impressed ornithologists for decades with their ingenious use of tools to winkle out hard-to-reach prey. While debate persists over whether their skill-set is inherited or "learned" through social interaction, Klump said she had no qualms about labelling the birds smart. "They are really well adapted to their environment and they have clearly evolved traits of tool use and picking these specific plants—that tells us much about how they interact with their environment," she said. "Clearly, they are intelligent in that they can solve a lot of problems."